I recently came into posession of an Albion Munich. 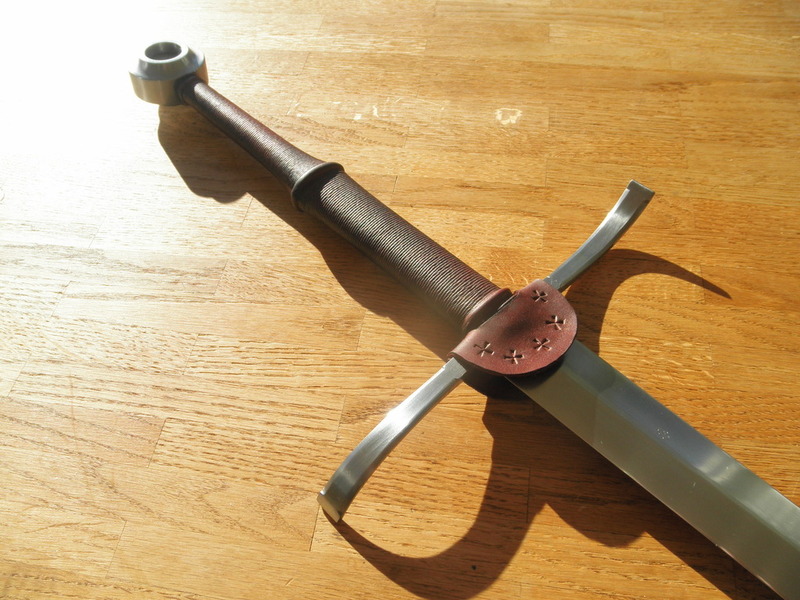 It is a sword I‘ve always admired and actually the one I drooled over the most when I first stumpled across Albion‘s website as a 16-year-old teenager. Couldn‘t afford it of course so I turned to making these things myself. 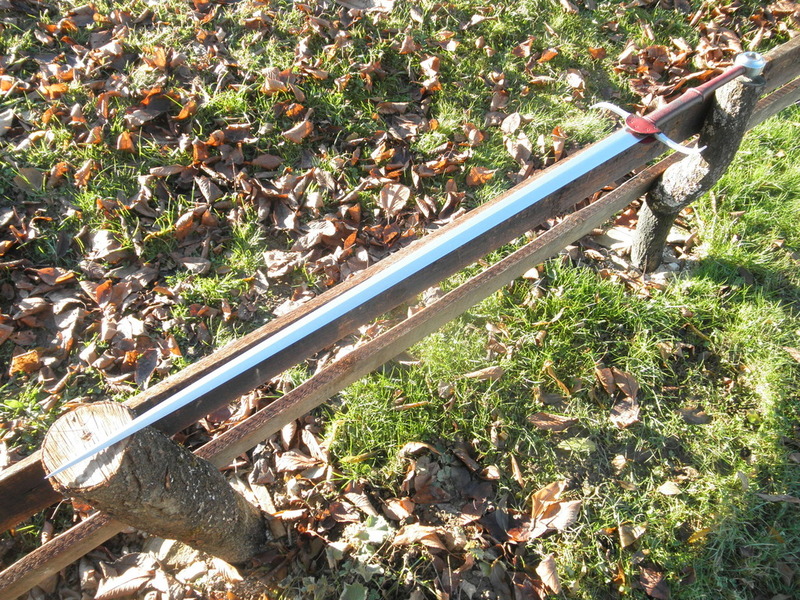 The blade was properly sharpened and hand polished. 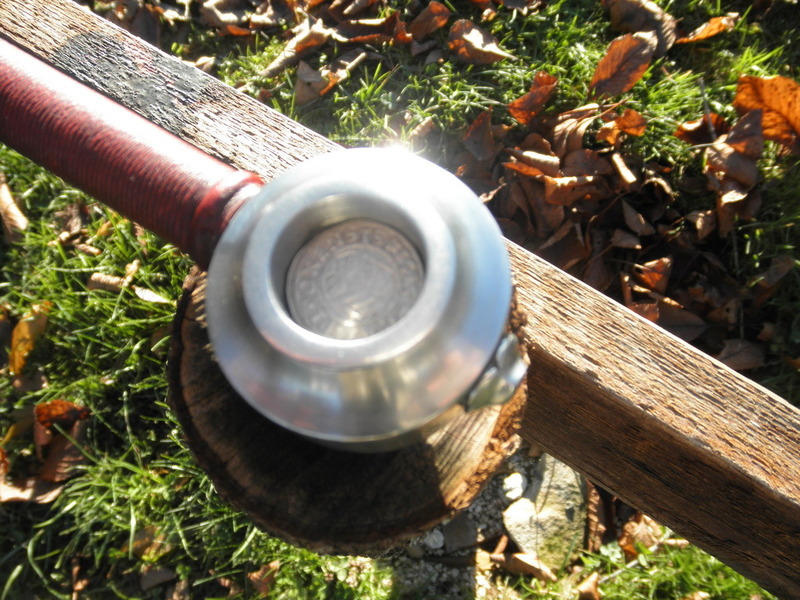 Two original medieval coins from 1509 and 1515 were added to the pommel. Though the original the Munich is based on is most likely from 1450-1480, I referred to Albrecht Dürer‘s engraving „Ritter, Tod und Teufel“ from 1513 and used coins from that time period. The coin dated to 1515 is from southern Germany (the city of Kempten), the slightly older one from Poland and shows Sigismund I‘s crown. I would have preferred coins from Nürnberg of course (Dürer‘s hometown) but this is what I could get in the right size. The guard on the Munich is very plain. 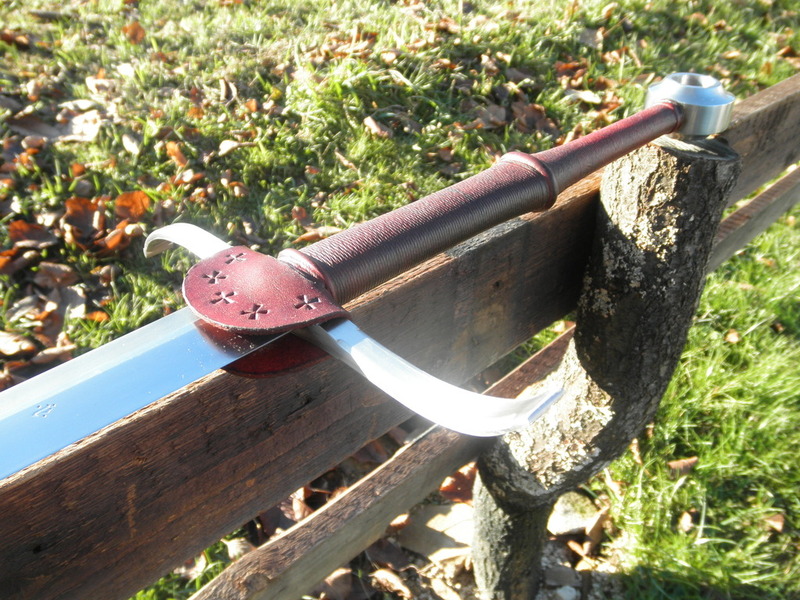 I wanted to give it a little bit more flair so I filed in some bevels as is typical for this type of guard. The original has them (though only on one side?). I also added a cross-leather to the guard. The original sports a tubular chape but I‘ve always preferred the flap-type. This is consistent with the sword shown in Dürer‘s artwork, as that one also appears to sport a D-shaped cross leather. The chape is decorated with simple punched-in crosses. Goes well with the simple and elegant rest of the sword I think. I only took a few in-progress shots of making the cross-leather and none of the finger-numbing file work I did on the guard. Though I usually don‘t enjoy leather work, this here I found very pleasant. It was not easy to match the very uneven dye job of the grip but it turned out well enough I think. I‘m very happy with how this turned out and am very attached to this sword. 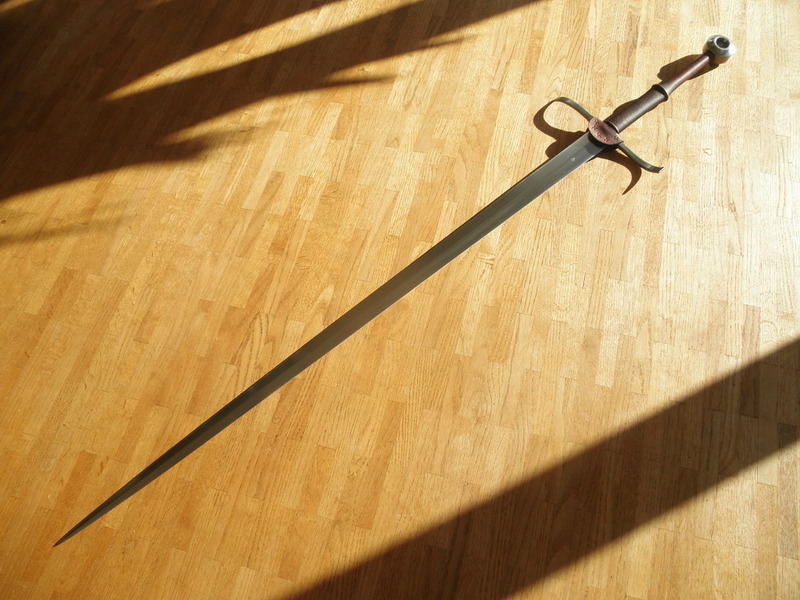 Functionally, it is a wonderful weapon and just what a HEMA longsword enthusiast likes. 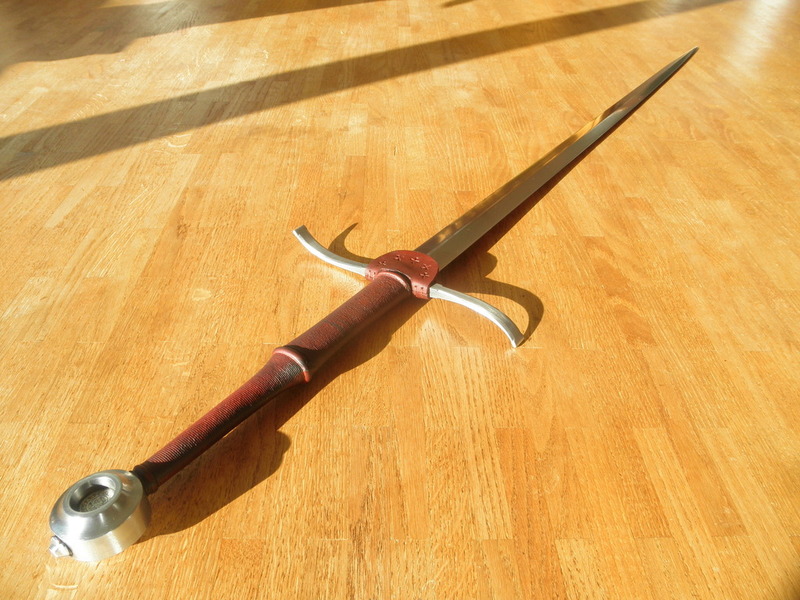 As a swordmaker, I very much value the skill that went into creating the original and of course such an exact replica. Personally, I value it as something I‘ve long been dreaming of and also something that reminds me of a good friend. Overall, this may be the favorite sword in my collection. I try not to get too attached to my own blades as they always end up being sold sooner or later. This one I know will always stay with me. 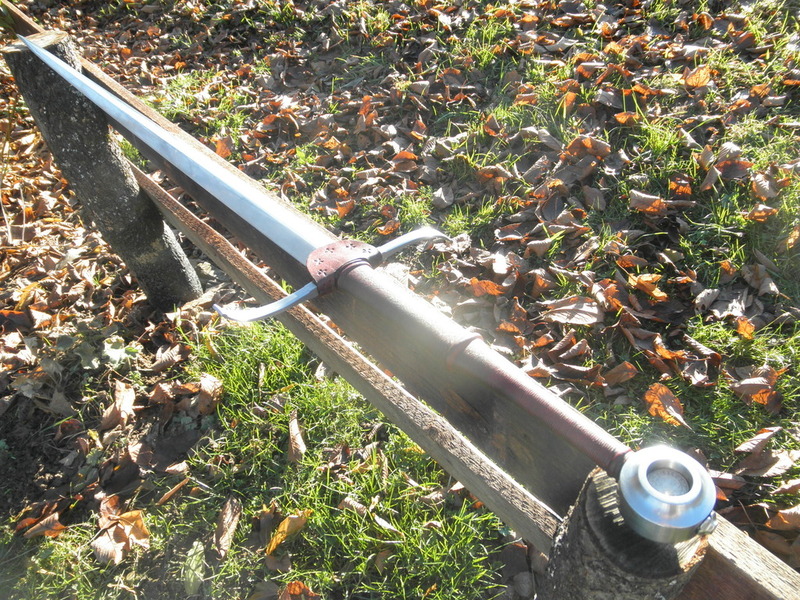 Very nice Lukas, that rain guard does a world of difference to dress up the sword! 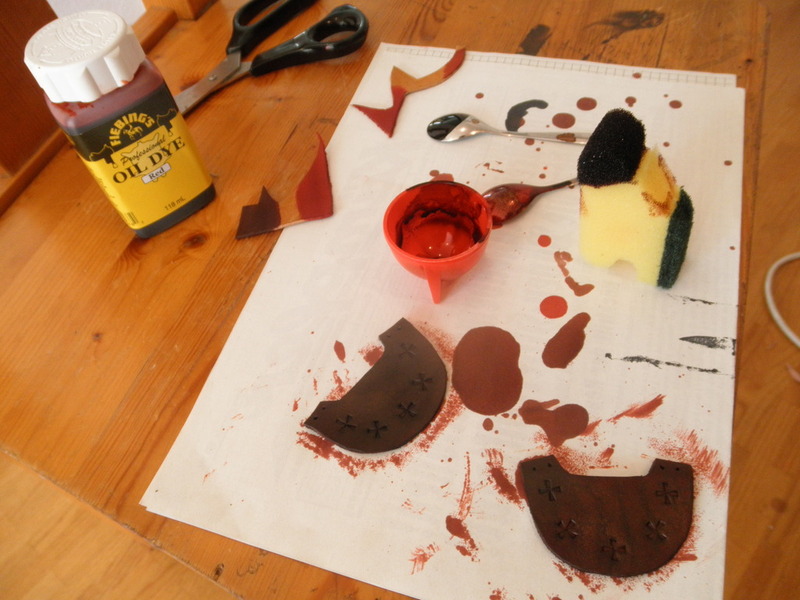 I see you are using oil dye and that the finish/coverage is very even. Any better than the fieblings acrylic? 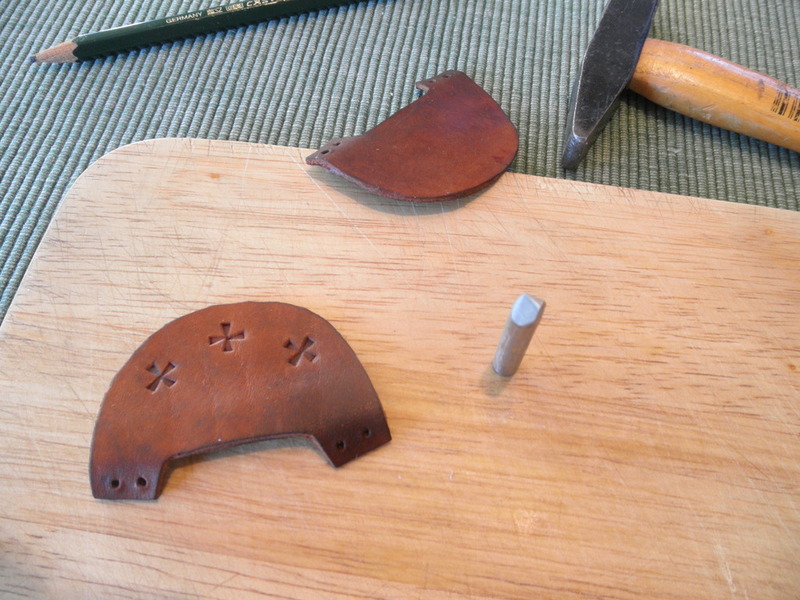 You could still do an overlap linking the leather flaps to the grip - I bet the transition would be invisible if you press it down against the lower side of the bottom raiser with cord (I did that once on a leather grip wrap that I was happy with but had a tiny open seam under the pommel showing the wood, I cut along the top raiser with a hobby knife and removed the leather, and wrapped the top above the raiser with another piece of leather - it was impossible to tell the difference once dry and dyed). Thanks, Julien. Yes, quite interesting how much that little bit of leather changes the look if the sword. I've never tried acrylic so I can't say but with some trying out and multiple layers I was able to match the grip well enough... main problem was that the grip is very uneven in color with black seeping through in multiple spots. I darkened the leather overall a good bit to make it blend it better which helped. I'm quite happy now, was actually considering trying to re-dye the grip again (not sure that would work seeing as I just recently treated it with leather fat) but for now at least I'll leave it. Here's a cutting video with the Munich. Might interest a few people. 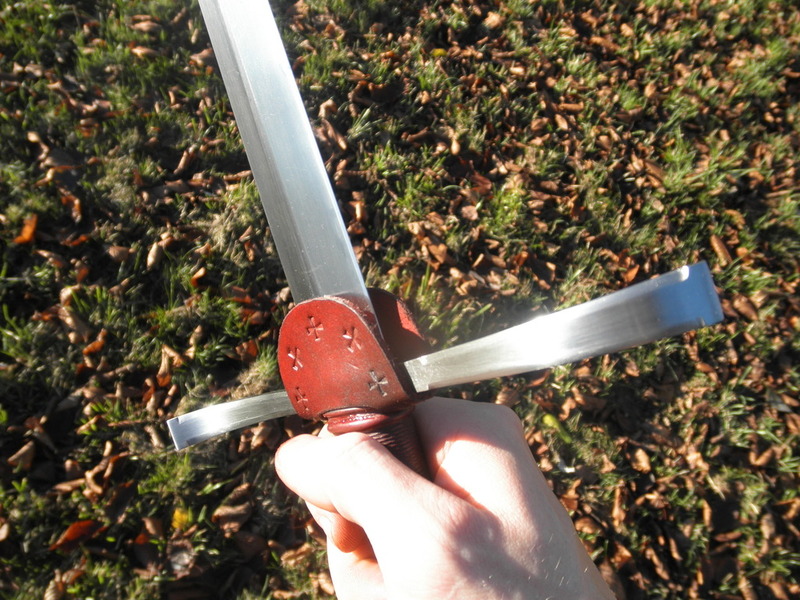 It is obvious that this slender XVIIIb is not a cutting-oriented blade type. It is narrow and has a thick spine, both leads to a less-than-optimal angle on the main bevels. So naturally, the cutting performance is nowhere near that of a wider-bladed XVIIIa or other cutting-oriented blades. It is, however, a perfectly adequate cutter. Cutting a bit further down from the point and with good technique, newspaper rolls the size of my forearm can be cut through cleanly. Even if it doesn't make it all the way through, the blade always leaves deep gashes that would be absolutely enough for a serious (fight-stopping) wound. I have no doubt the blade will go through tatami without issue, looking forward to testing that. Very cool Lukas. Very very fine work on the rain guard and great pictures. Yeah, the cutting stand is in dire need of being fixed I keep forgetting to do it only to be annoyed anytime I want to cut something. Thanks, Bryan, glad you like it!